M.V. 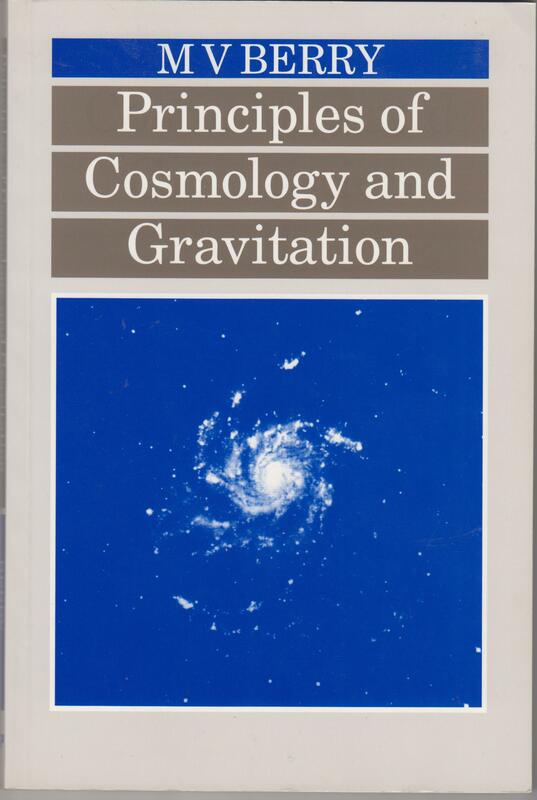 Berry, Principles of Cosmology and Gravitation (Bristol: Institute of Physics Publishing 1989). Yesterday came the news of the death of the great British physicist and cosmologist, Stephen Hawking at the age of 76. Hawking had suffered for most of his adult life from motor neurone disease, since he was diagnosed with it in his early 20s. He was given only three years to live, but instead managed to live out a very full lifespan working on his theories of the origin of the universe and Black Holes. He was a great ambassador for science. His book, A Brief History of Time, was a bestseller when it appeared in 1980s, although he admitted that it was probably a book few finished. And he showed that it was still possible for a disabled person to do cutting edge research, provided they had the necessary technical and medical support. In his case, it was his wheelchair and the machine that allowed him to speak, first of all by keying in the words, then by twitching just a single muscle. Some of the praise seemed a bit too fulsome to me. Like when they started saying that he was the greatest scientist since Newton and Einstein. I don’t think he was. And Hawking on his own didn’t unlock the secrets of universe or Black Holes, as the Beeb’s presenters also claimed. As for his great sense of humour, well, it existed, as his appearance on shows like The Simpsons demonstrated, but my memory of it is marred by him turning up with the TV critic, Victor Lewis Smith, telling fart jokes and laughing on the 1990s series, Inside Victor Lewis Smith. But it really was inspiring to see how he was a great hero to the ‘A’ level students at a science fair yesterday, and how he had inspired them to become interested in science. One of the complaints Richard Dawkins has made about popular science programmes is that they’re too ‘dumbed-down’. He points out that they have to have lots of explosions, and they mustn’t include equations, in case that scares people off. There’s a lot with which I don’t agree with Dawkins. I’m not an atheist, and have argued on this blog against him and the other militant atheists. But he is right here. Scientists writing the popular science books have said that they’ve been told by their publishers to leave equations out, because every equation in a book damages sales. 2.3 The red shift and the expansion of the universe. 3.1 The need for relativistic ideas and a theory of gravitation. 3.3. Difficulties with Newtonian mechanics: inertial frames and absolute space. 3.4 Inadequacy of special relativity. 3.5 Mach’s principle, and gravitational waves. 3.6 Einstein’s principle of equivalence. 4 Curved spacetime and the physical mathematics of general relativity. 5.1 Spacetime near an isolated mass. 5.2 Around the world with clocks. 6.4 Galactic densities and the darkness of the night sky. there’s also a bibliography and index. I’m not claiming to understand the equations. I struggled at both my ‘O’ level maths and physics, and what I know about science and astronomy I learned mostly through popular science books. But in the mid-1990s I wanted to see at least some of the equations scientists used in their explorations and modelling of the universe. One of the popular science books I was reading said at the time that this book was at the level that people with ‘A’ level maths could understand, and this didn’t seem quite so much a jump from my basic maths skills. So I ordered it. I’m afraid I can’t say that I’ve read it properly, despite the fact that I keep meaning to. Some of the equations are just too much for me, but I can follow the explanations in the text. I’m putting this notice of the book up here, in case there are any budding Stephen or Stephanie Hawkingses out there, who want to go a bit further than the pop-sci explanations, and see for themselves what the maths behind it all is like. Hawking has passed away, but it’s clear that he has inspired many more people to become interested in this rather arcane branch of the sciences. I hope this continues, despite the Tories’ attack on education and science and research for its own sake.